I’m kinda done with skinny jeans but i love how his seem to sprout up out of his rugged boots. this outfit would look so much cooler if he didnt have those leggings that some people call jeans..Im not saying this doesnt look good. I can visualise a pair of slim dark grey trousers tucked into those boots, and that would add that ‘oomph’ to me. Whatever! Skinny jeans 4 life!!!! I love the color palatte! But the jeans are a bit overdone? I agree with the legging comment. If it were a longer top it might work but then again…no. A pair of plaid knickerbockers would have been a great choice too (instead of the leggings resp. jeans). Great taste though on the other outfit. Without doubt the overall effect of the outfit is appealing. I am pleased as punch that like half the “boys” in the east village or chelsea gallery are, he is not a.) sporting camel toes & b.) letting the backside of his jeans droop!!! At least for a young man he has the audicity to pull together a complete look. I love the mix of High/Low Vintage/New. I am giving credit where it is do…taking a risk. For thoose who are so quick to judge, have you looked in the mirror lately?? There is a reason WHY there are so many Gap and Banana Republic stores! I think his jeans are even tighter than skinny jeans. I’m impressed he even got them on! Other than his pants being painted on, I really like his entire outfit. Are you sure they are skinny jeans and not denim “treggings”, the new even tighter trouser/legging-mix that supposedly will be the big thing this automn? Those boots are great. What make are they? I’m usually right there with you guys, but I have to disagree on this one. This outfit is a category five disaster. I think the jacket and boots look fab, but the denim leggings and baby doll dress t-shirt appear to have been snatched from his sister’s closet. Replace the leggings with slender, properly fitting jeans and get a men’s t-shirt that is also appropriately slender and then you’ve got a fantastic looking ensemble. Makes you think about the highly unlikely but intriguing idea of tights for men. After all, they were a fashion staple for, oh, two-hundred years? There are skinny jeans and then there are denim leggings. These just make me uncomfortable. Maybe I have missed something,but I have not seen men wearing jeans this tight.Lucky me,cause I think these just look horrible and the shoes don´t make them any better.Unhealthy for men too! There are ‘skinny’ jeans and then there are ‘skin tight’ jeans. This this example falls into the latter. I think there is nothing wrong with either but the fact of the matter is that guys with bulk in the quad/calf areas risk resembling stuffed sausage legs in particularly painted on denim… which is basically what every one else thinks. On the plus side, the boots are great and his choice of denim reflects that he knows this. does he have to speak in falsetto with these pants on? Fitted jeans can look great, skinny jeans i have never seen look great on anyone. Ever. the jeans are tights not jeans. nicely done otherwise. big boots are back. a shout-out to my roommate-de-sartorialized. Interesting photo. This young guy has something of a Fun Boy Three look going on. I must say, I’m not into skinny jeans in any way, shape, or form (except on women). These look awfully tight to me. Very restricting. I hope this young fellow is not expecting to father children. How unfortunate. I’m a woman, and his jeans make me squirm with discomfort. That said, I like his jacket and boots, and the way he laced them. I lovelovelove the jacket, but there’s a Peter Pan-goes-hiking element to the rest of the outfit that just doesn’t work for me. There’s a difference between skinny jeans and tight @ss jeans. Dang! This is wrong in execution but conceptually balanced (loose on top and bottom while slim in the middle). Love the boots. Any idea where I could find a similar pair for not a ridiculous price? i love the jacket, however the shirt is absurd and too low cut for most women. i think the pants are a disaster; but evidently i’m not alone on that one. Wow those jeans look like they are pasted on! Otherwise, the look is very urban chic and it translates well. I could see it here on the streets of SF and also overseas in Europe. Love the boots. 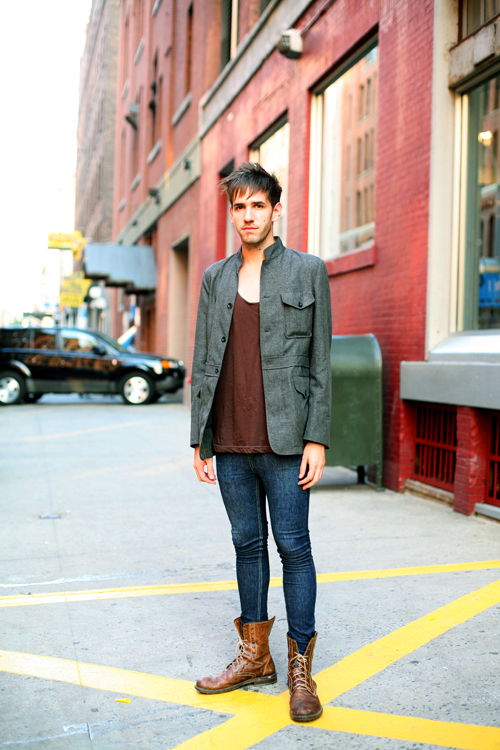 i love skinny jeans on skinny guys but this is more like tights..
I’m so tired of seeing young men dressed this way. The genders really can take this androgyny thing too far, and honestly, when I look at guys dressed like this, my libido disappears completely. Anyway, to speak to the (sigh) “outfit,” the boots are great, but that’s about it. Everything else, including the grooming, needs an overhaul. Okay, can someone explain to me how it’s possible to get into jeans that skinny? The boots are supreme, and the boy deserves credit for managing to slip those leggings on, but the dress he’s wearing, what’s going on there? looks like the young fella is trying to show some cleavage. sorry, love, but you don’t have the tatas to pull it off. geat outfit and boots. So over the jeans though. if skinny jeans are headed out, if not so already, does anyone have any ideas of what’s next in denim fit for men? i want those boots, anyone know where to find? he’s gorgeous and i love his boots as well as his jacket, but those jeans really aren’t working for him. if he wanted that sort of fit he should just wear leggings because the jeans look pretty awful on him. don’t get me wrong – i love skinny jeans on boys – but these are just far too tight. He looks ready to do Shakespeare in modern day setting, doesn’t he? To be or not to be (dressed in tights), that is the question. I love those boots. How does one go about obtaining a pair of boots like those? With such thin leather through the ankles that they can pair as well with slacks or trousers than with jeans. umm hello, haven’t you ever heard of stretch jeans? These were all the thing in the early 90s, and, as a shopgirl at the time, I used to sell the women’s cut in the teeniest sizes to gay men who loves to go clubbing all the time. you can’t deny that he has nice muscular legs. that’s what saves him from looking emaciated. those arent skinny jeans, they are tights, this look is forced. i’ll grant you that this kid has some sense of style, but the super-tight jeans, the flauncy wide necked shirt and even the haircut are way too “irony of the eighties” for me. it’s a trend that, along with uggs and girls in baseball caps, can’t end soon enough for me. I’m losing circulation just looking at the tightness! This is an unflatteringly elfish look. The jeans are practically leggings, and while I won’t write off skinny jeans wholesale, this is not how to pull them off. The boxy upper half contrasted with those horrible jeans gives the effect of stubby legs and womanly curves! One of my greatest pet peeves about poorly worn skinny jeans is the tendency to create an immensely unattractive cone effect in the leg. Average to slender women and men who aren’t athletic and don’t train their calves in the gym often have skinny calves (due to genetics) even if their thighs are comparatively thick, and the contrast looks downright bizarre in a t-shirt and skinny jeans. Re: Butch and “leggings for men,” I laughed, but seriously, if they return, they better not be denim. Oh please, fashion overlords, don’t let them be denim. Re: “Okay, can someone explain to me how it’s possible to get into jeans that skinny? Sometimes they have zippers or some small percent of spandex for stretch! sorry Sartorialist, usually you are my Hero of Elegance in Dress but you lost it on this one…. Mmm.. I really don’t know about the jean… the jacket’s great though! Ouch. That looks extremely uncomfortable. Such a conservative crowd! Stretch jeans have been worn by punk rockers since, what, the late 70s? (Usually in black, though.) This look is fun and appealing – maybe not for the country club, though, eh? Perhaps that’s part of the point, after all. jeans? or did he just paint his legs blue?? Odd, but consisten volume can be a success, in this case however, the extremity of the jeans does not compliment the rest of the outfit well. Fantastic boots though. Maybe this person just felt like he wanted to be on the street half-naked with a pair of amazing boots. —–Talk about the true skin-tight jeans. I don’t think he’s bulky built, but he’s definitely not skinny a guy enough to wear these. Makes him look quite grotesque actually. Just jeans like Levi´s 511, slim but not skin-slim!